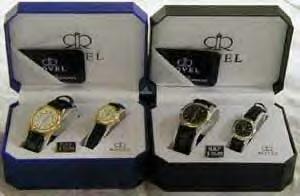 These are very nice watch sets with quartz movement and genuine leather bands. Each set is cased as shown. Bodies are assorted silver and gold tone. Face colors are white, two tone blue and black. Cases have a mix of different styles. We got a great deal on these and are passing the savings on to you. Send mail to char8877@yahoo.com *At Your Service, Business Solutions* with questions or comments about this web site.